The Dell Inspiron i7559-763BLK gaming laptop boasts a long battery life, powerful quad core processor and rich graphics, allowing you to game, stream videos and do other intensive tasks on the go with ease and confidence. The Dell gaming laptop’s 6th Generation Intel Core i5-6300HQ Quad-Core Processor is a big part of what makes this laptop so great. The processor’s base frequency is 2.30Ghz and its max turbo frequency is 3.20GHz. It has a 6MB SmartCache, which is a thing Intel does where all of the cores can access all of the CPU’s cache, basically. It makes everything run smoother. The i5-6300HQ’s max memory size is 64GB and it supports DDR3 and DDR4 memory type variants. The processor graphics are Intel HD Graphics 530, and it supports DirectX 12. It can support three displays and a max resolution of 4096×2304@24Hz. (Though the resolution will vary depending on other factors and is almost always lower than the max resolution). The processor’s robust capabilities support and optimize many of the other features that make this laptop a bona fide gaming laptop. NVIDIA’s GeForce GTX 960M graphics card was explicitly designed with gaming laptops in mind. This series of graphics cards aren’t just meant to play nice with gaming laptops—they’re meant to be the graphics card of choice when it comes to gaming laptops, and when you delve into their individual elements, it isn’t a wonder why. According to NVIDIA, their Dynamic Super Resolution (DSR) Technology can deliver “4k fidelity to 1080p displays”. And that’s pretty amazing, because graphics aren’t always vibrant or even crisp on gaming laptops, and that’s a bit part of what sets this graphics card apart from the rest. The GTX 960M not only offers great graphics, but it optimizes graphics performance with features such as GPU Boost 2.0, which auto overclocks your system safely, and NVIDIA’s Optimus Technology, which allows your PC to transition between the GTX 960M graphics card and its Intel integrated chip in the background, so you get the graphics that are best for your current applications instead of a one-size-fits-all approach. And last, but absolutely not least: NVIDIA’s BatteryBoost Technology works to keep your graphics from draining your battery life unnecessarily fast, so you can game longer while unplugged. 8GB RAM is pretty standard when it comes to gaming laptops and here’s why: Most recent PC titles list 8GB as their recommended RAM. Some of the newer ones actually require 8GB as the bare minimum, though this is rare, and games requiring a minimum of more than 8GB are extremely rare, because in those cases, bad coding is often to blame for why the game can’t run properly on a standard amount of RAM. So yeah: As of 2017, 8GB is more than adequate to play most modern titles as far as RAM goes. However, other factors like the graphics card will also factor into whether or not you can play a certain game. DDR3L isn’t the newest RAM type now that DDR4 is out, but it’s not a bad thing for a very good reason: DDR3L is lower voltage than standard DDR3 RAM. Therefore, newer processors that can’t handle high voltage RAM can often handle DDR3L. So, basically, you’re good with DDR3L, and it’s a much better choice than DDR3 standard due to the current trends in processors. The 15.6-inch FHD display is an awesome way to view the lush graphics the GTX 960M card provides. The screen is also anti-glare and wide-angle for that nice, cinematic quality while watching movies and game cut scenes. If you’re not use to gaming on a laptop, touch pads can be a bit tricky to get used to. Dell’s laptop has a very precise touch pad that’s fine-tuned enough to be primed for gaming. In other words, you won’t feel clumsy while using it for gaming and you won’t have to rely so much on hot keys to do what you want to do. The matte black casing is nice and lowkey; a hint of sportiness comes in with a slim, discrete red border around the touch pad, which doesn’t look as bad as it may sound to those of you who want your touch pad to blend in more with the rest of it. Meanwhile, the laptop itself is thin and not bulky, which is cool, because gaming laptops—especially older ones—are cumbersome and heavy. With this one, it doesn’t flaunt its power with its appearance, which many will find all the more appealing. You can toggle backlighting off and on with the keyboard, which makes gaming in the dark a lot easier. A small feature, but not one to overlook. You may be wondering what SSD storage is if you don’t keep up with geeky computer ins and outs. Basically, it’s a type of solid state storage that works more like a thumb drive with a series of chips instead of the spinning disc hard drive. With SSD, bootup is faster, load times are faster—everything is faster. But speed isn’t the only benefit. Because of their chip-like structure, SSD storage drives are more durable, while a tiny drop can fracture a traditional hard drive. Your stuff is safer with SSD for that one reason alone. Also, because of their different structure, SSDs are quieter. They don’t spin. They just do their thing. They consume less power, which is part of why they’re so fast, but that less power consumption reduces latency and also increases power efficiency. Furthermore, by nature, they run cooler than traditional hard drives, so your system runs cooler and your other components live longer. As for storage size, you may find 256GB a little alarming if your last laptop had a terabyte or more of storage space. The reason for this is SSD storage costs more per gigabyte than traditional storage. This is its real downside. So, while your typical mid-range laptop might have 1TB of hard drive space, a comparable SSD storage laptop might have 256GB, because that’s mid-range for SSD storage. As of 2017, the only people who really go with SSD drives with 1TB or more of storage are professionals who require that space and find that the efficiency is worth the added cost. But as SSD tech ages, it will get cheaper. And in the meantime, most gamers don’t really need more than 256GB of SSD storage anyway, unless they also do a lot of video editing or other applications that eat up large amounts of storage space. The Waves MaxxAudio Pro combines professional sound processing with a built-in subwoofer and premium speakers to produce its great audio performance. Not every gamer considers superior audio a must-have for a gaming laptop, but it’s always appreciated and can’t hurt. Two cooling fans backed by 240 thermal fins move air through the system and out of three exhaust vents to keep your laptop cool and healthy. How fast your battery is drained depends on a lot of different factors like how well you maintain your system, how old the battery is, what type it is, what processes you’re running, etc. But if we’re being real here, a long battery life is absolutely vital for getting the best out of your gaming laptop. The Dell laptop offers more than ten hours of battery life. Again, whether or not you get this depends on what you’re doing, but the fact that it’s possible is pretty nifty. I thought the Dell 15.6-inch gaming laptop looked kind of on the sporty side, which I like. The matte black finish is classic, but that extra touch of the thin red border on the track pad is what really makes that sporty aesthetic standout. However, it’s not so sporty that those looking for a chicer laptop will be put off, so it’s a nice balance. For performance, the graphics are top-notch. I spent a lot of time playing BioShock Infinite and Far Cry 4 for on ultra settings and experience was great. The graphics were richly detailed, clean and the games ran smoothly. I also love how quickly this system boots. I don’t have a lot of time on my hands lately, so when I game, I want to get down to business immediately. I hate slow load times because it takes away from my game time. That just isn’t an issue with this laptop thanks to SSD storage leading to faster bootup. I love it. 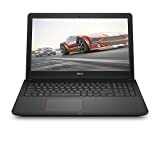 The Dell gaming laptop comes with one lithium-ion battery, which is required for operation, as well as the warranty detailed below. The 6th Generation Intel Core i5-6300HQ Quad-Core Processor and SSD storage are superfast. Remember, SSD boosts faster than traditional hard drives and also starts applications quicker. The fast processor with the 8GB of RAM allow for pretty impressive gaming power, which is only amplified by the NVIDIA GeForce GTX 960M graphics card. It’s a very capable graphics card with the ability to play many new and popular titles on ultra and high settings. The graphics card isn’t the only determiner about whether or not a game is playable—amount of RAM also comes into play, though 8GB is usually sufficient and recommended. Most games allow you to customize your settings so even if the stats say you can only play on medium settings, you could sacrifice some aspects you don’t care about (like shadow) and set those to low so other things look good. How much you can tinker depends on your system and it’s about feel and performance, but it’s generally safe to do as long as everything runs smoothly without graphics artifacts or overheating. This gaming laptop comes with a Dell limited warranty, so if there are any defects or it’s dead on arrival (DOA), that should be covered. Only 256GB storage space, so it’s not ideal for multimedia professionals; however, for most users 256GB of space is more than adequate. The Dell 15.6-inch gaming laptop is a great gaming laptop. I’d recommend it readily in large part due to its GeForce GTX 960M graphics backed by an awesome processor, 8GB RAM, and SSD memory, which work together to provide the high speeds and lush graphics necessary for a great gaming experience.